Some say the Great Lakes are haunted. They have caused the demise of many a sailor, and within their waters lives the blood and despair of lives cut short. This is one such story. They came from Duluth. From Toledo. From Sturgeon Bay, Iron River, St. Joseph, Ashtabula and Milbury. 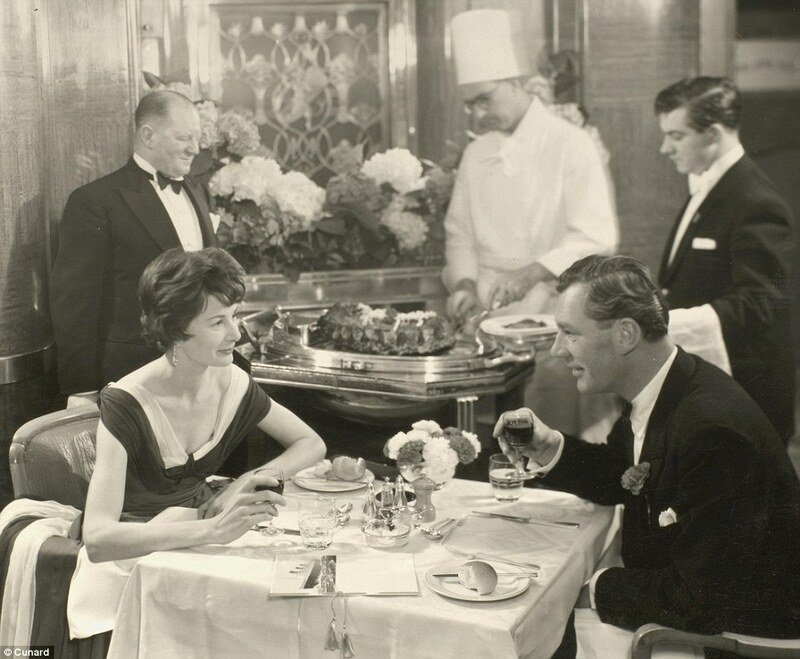 They worked as oilers, engineers, first mates, captains, cooks, watchmen and deck-hands. Their names were John, James, William, George, Russell, Bruce, Oliver and a few Thomases. They were husbands, fathers, sons and brothers, beloved of many. Some were as young as twenty, on their first trip out. Some were in their fifties, making a last voyage before retirement. Twenty nine men lost their lives in the wreck of the S.S. Edmund Fitzgerald on November 10, 1975. They are gone but not forgotten. It started with a mighty ship. Yet the Fitzgerald had an ominous beginning. When she was christened on June 8, 1958, she slid into the water at a strange angle, then jolted and crashed back into the dock. Spectators said it seemed like the gargantuan ship was “trying to climb back onto the dock”, as if the vessel had a mind of its own. One observer was so startled by the sight he actually had a heart attack and died! The weather was balmy on the morning of November 9, 1975, when the Mighty Fitz left out of Superior, Wisconsin. She was under the command of Ernest McSorley, a seasoned captain with many years experience. They were en route to a steel mill on Zug Island, near Detroit, where they would deliver 26,000 tons of iron ore.
November is storm season on the Great Lakes, and so it was not unusual when the National Weather Service predicted that some turbulence would pass just south of Lake Superior that night. The crew probably thought nothing of it. At around 5 pm, the Fitzgerald joined a second freighter, the S.S. Arthur Anderson, which was under the command of Captain Jesse Cooper. Through the two captains’ communications the final reports of the Fitzgerald’s demise would be recorded. At 7 pm on the night of November 9, the National Weather Service issued a gale warning for all of Lake Superior. The captains decided it would be best to alter their course northward, seeking shelter along the Ontario coast. At around 1 am the gales turned into a severe winter storm. The Fitz reported winds of 52 knots (60 mph) and waves 10 feet high. That is a pretty bad storm! But by daybreak it had gotten worse. Waves up to 35 feet high were crashing over the deck of the Fitzgerald. McSorely and Cooper, both veteran captains, thought they had seen everything. They were about to meet their match. 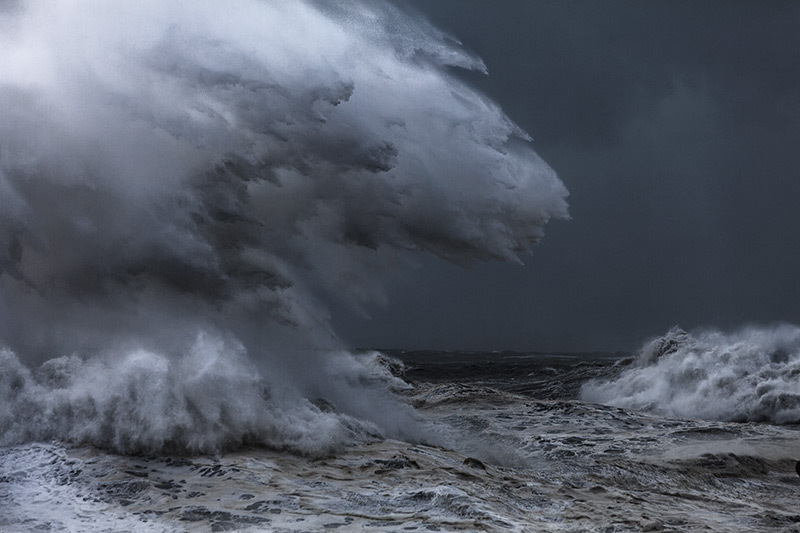 The worst of the weather was blowing right toward the ships, so the captains decided to change course again. They would head south, attempting to reach the safety of Whitefish Bay. This, however, involved crossing the dangerous ‘Six Fathom Shoals’ – a bed of jagged rocks, hidden in a mere 36 feet of churning water. The shoals could tear a ship to shreds. To make matters worse, it began to snow! In the blizzard white-out, nothing was visible and the captains then had to rely on their radar systems. At around 3 pm, McSorely reported that his guard rails had collapsed and two vents were damaged. Water was coming in. The bilge pumps were on but unable to empty the ship fast enough. To make matters even worse, within an hour, the Fitzgerald’s radar system failed! The crew now sailed blind, with only radio communication to guide them. Meanwhile, 30 foot waves washed the deck. McSorely, who had been sailing the Great Lakes for 44 years, said this was the worst storm he had ever seen. By 7:30 the snow had cleared. Cooper tried to locate the Fitz, but she had completely vanished. 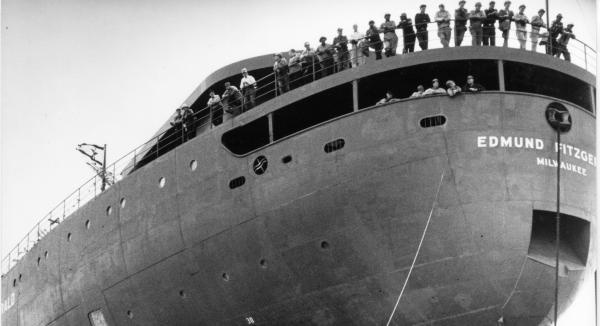 The Arthur Anderson sailed to safety in Whitefish Bay. Cooper then contacted the US Coast Guard and they began a search. Because the Coast Guard lacked sufficient crew for a full rescue, they asked Cooper to take the Anderson back out and help. Cooper was reluctant to re-enter the terrible storm. But he agreed, further risking his own life to help save the men of the Fitz. Another ship, the S.S. William Clay Ford, bravely joined in as well. They searched for three days. Reportedly, they found a torn lifeboat and some debris, but nothing else. On November 14, a US Navy Lockheed aircraft, piloted by Lt. George Conner and equipped to detect “magnetic anomalies” that were usually associated with submarines, found the wreck. The Edmund Fitzgerald lay about 15 miles west of an inlet in Ontario which was called (ironically, or appropriately) “Deadman’s Cove.” The ship was split in two pieces at the bottom of 530 feet of water. The bodies of the crew members were never found. The Fitz had been only 17 miles away from the entrance to the safe harbor of Whitefish Bay. One can only imagine the sadness and shock the families faced when they got word the men had been lost on the lake. Doreen Cundy, the widow of watchman Ransom Cundy, received a phone call from a friend, but refused to believe the ship had sunk. She turned on the news and to her horror, saw that her friend had been right. The most bizarre thing about the shipwreck is the quickness in which the ship went down. She had been in steady communication for so many hours, then she just disappeared without so much as a mayday call. Captain Cooper believes that the Fitz may have hit a shoal that produced a leak, unbeknownst to the crew. The day after the wreck, Mariner’s Church in Detroit conducted a service for the deceased. 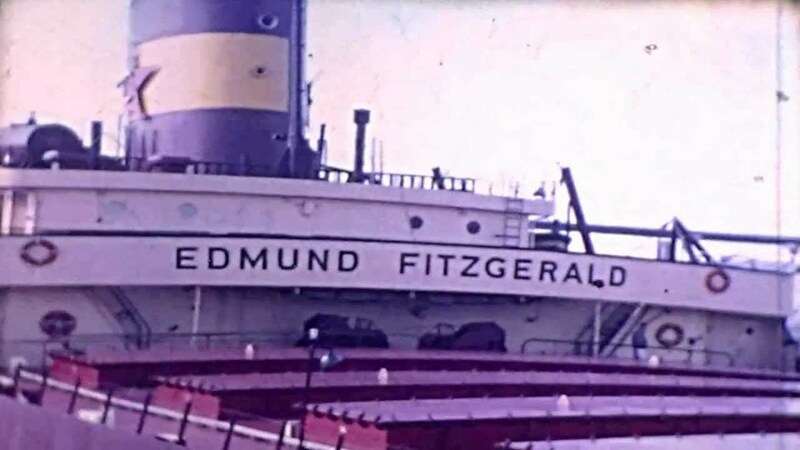 The names and occupations of each man was read, and the bell was rang 29 times, once for each man of the Edmund Fitzgerald. A full list of them can be found here. Gordon Lightfoot, a Canadian composer, saw a news story of the shipwreck in which ‘Edmund’ had been spelled ‘Edmond’. He thought this showed incredible disrespect for the captain and crew. In response, he wrote his ballad “The Wreck of the Edmund Fitzgerald”. A problem shared is a problem cut in half. Speak your truth. Break the silence.